Described as “an unassuming artist with a penchant for indie rock… forging a style built on understatement, logic and clarity” (Phillip Lutz, Jewish Daily Forward), guitarist Nadav Remez is one of today’s emerging voices on the jazz scene, and his music is gaining the attention of both fans and music critics worldwide. 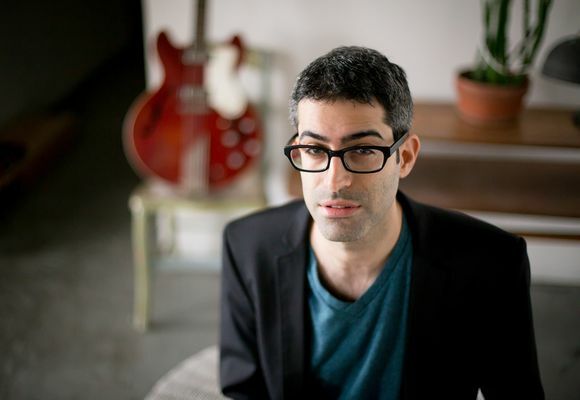 His guitar melodies have been described as “haunting” and his music as an intriguing combination of modern jazz, alternative rock and Jewish folk. Through his “consistently seductive lines, Remez show[s] why he has emerged as a standout among a new crop of Israelis making waves in the jazz world” today, says Lutz. Hailing from the outskirts of Tel Aviv, Israel, Remez’s musical education took a critical turn at the Thelma Yellin High School for the Arts, renowned for producing well-known international jazz musicians. There, he was exposed to a variety of musical traditions, both western and eastern, which he molded into his own unique musical vision. Remez received a full scholarship in 2005 to attend the Berklee College of Music in Boston and went on to complete his Masters in Music at the New England Conservatory in 2008. During these formative years he had the opportunity to study with the likes of Joe Lovano, Billy Hart, and Miguel Zénon. Remez’s debut album, So Far, was released in 2011 on Brooklyn Jazz Underground Records and praised for its “poignant melodies, rich harmonies and stirring improvisations that ring out with clarity and emotion,” and as “moving, meaningful music by an emerging talent” (JazzTimes). Featured on the recording are James Wylie, Steve Brickman, Shai Maestro, Avri Borochov, Ziv Ravitz and Itamar Borochov. So Far was celebrated by a US release tour at venues such as Smalls (NY), Chris’ Jazz Café (Philadelphia) and Twins Jazz (DC). In 2011, Remez also joined forces with celebrated jazz bassist Omer Avital and began to perform regularly with two of Avital’s ensembles, the New Jerusalem Orchestra as well as Omer Avital and his Band of the East. Remez appeared as a special guest with Third World Love at the Teatro Manzoni in Milan in 2012, and as a co-bandleader at the Atlanta Jazz Festival that same year with the Nadav Remez/Omer Avital Quintet. “According to Avital, Remez is one of the ‘very few serious ones who have the whole package, yet keep on growing and learning’” (Jewish Daily Forward). Remez’s thirst for new material led him to record most recently with bassist Haggai Cohen Milo on Cohen Milo’s upcoming album Penguin on Tzadik Records. Remez has performed as a sideman and as a bandleader in notable venues and festivals around the globe, including the Palatia Jazz Festival (Germany), Nancy Jazz Pulsations (France), the Montreux Jazz Festival (Switzerland), Bologna Jazz Festival (Italy), Zappa (Israel), NYC Winter Jazz Fest (USA), Chicago Old Town School of Folk Music (USA), Boston Jewish Music Festival (USA), First Night Festival (USA), International Music Showcase Festival (Israel), and the Israel Festival (Israel). Currently working on material for his second release, Remez continues to gain force as a young guitar innovator and jazz composer and arranger.